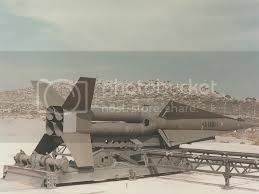 The Nike Hercules, was a solid fuel propelled two-stage surface-to-air missile, used by U.S. and NATO armed forces for medium and high-altitude long-range air defense. It was normally armed with the W31 nuclear warhead, but could also be fitted with a conventional warhead for export use. 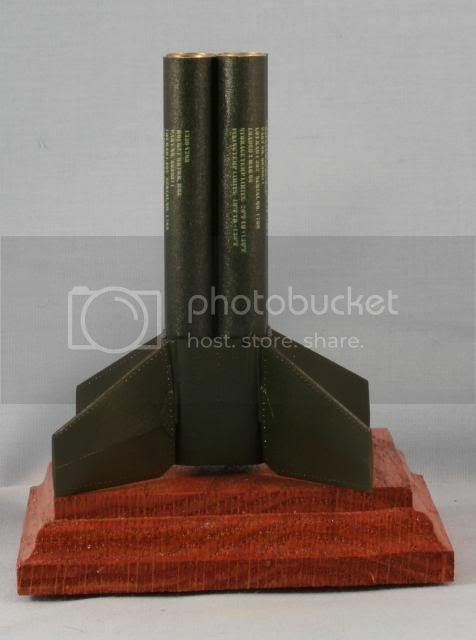 Its warhead also allowed it to be use in a surface-to-surface role, and the system also demonstrated its ability to hit other short-range missiles in flight. Hercules was replaced in the long-range anti-aircraft role by the higher performance and considerably more mobile MIM-104 Patriot. 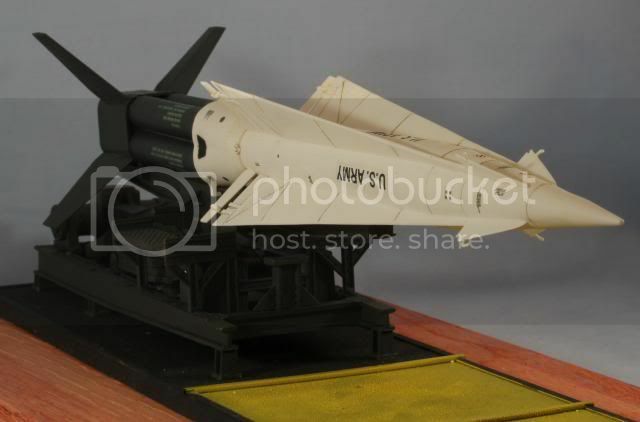 I will be using the classic Revell 1/40 scale Nike Hercules kit. First issued in the late 1950s the kit has seen a number of re-issues. 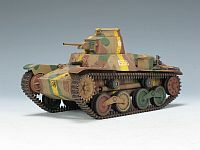 The kit is typical of that era with 3 small sprues and a minimum number of parts. The seams will need a bunch of work, some parts have cast in part numbers, which will have to be removed, but it will be a fun holiday build. This was a simple build from the standpoint of parts. The missile is assembled with about 12 parts. Unfortunately most of the seams fit poorly and require putty and sanding in multiple applications. Excuse the pictures as the kit is molded in white plastic. This is the main launch rail and lifting frames. The launch rail was a mess and requires a ton of putty and sanding work. After putty the seams on the fins nose and lower cowl, I painted the first stage with Tamiya Flat White. Then I coated the first stage with Future to prepare for decals. The decals that come with the kit are poor scale quality. After researching the markings made my own set of decals. All of the hatch cover stencils are essentially a font 1. The first stage is totally out of scale. It has raised bands and a raised center cover neither of which really exist. To replace the kit parts, I used 7/16 tubes to create the four first stage motors. I made a custom covering for each with the proper stencil marking for the rocket motors and background color. The four motor mounts are .020 styrene strip used between each motor. The strips and the lower fin section were painted with Tamiya JA Green. Here is the assembled first stage, coated with Future gloss to seal the markings. After mounting the complete missile on the launch rail, assembling the launcher, I mounted the completed kit on a platform. 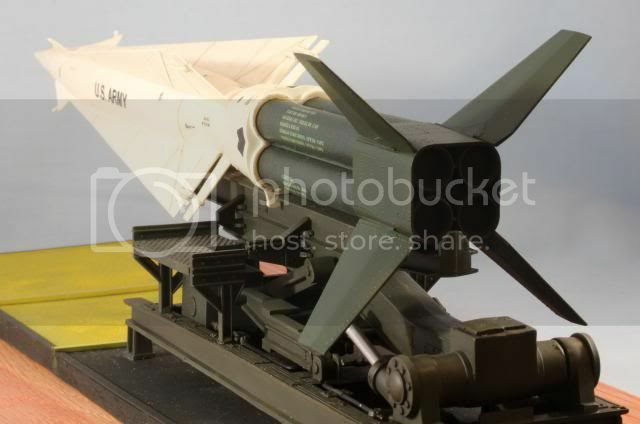 The launcher is painted with Tamiya JA OD Green and then coated with a semi-gloss clear coat. The elevating pistons are painted with Alclad Dark Aluminum. Here is the second stage after decals, panel lines, and a final coat of semi-gloss clear. Here is the first stage and adapter on the launcher, also coated with semi-gloss clear. This is a view from the rear. The rocket motor nozzles are painted with Tamiya NATO Black. That’s my quick holiday build. Though not full of details, but it is a good representation of this historical classic. As always if you have any comments, please feel free to drop in. I love it. Brings back memories. I had this kit as a kid. Is it still available? I'd love to have it again. It came out great Mike. Sometimes the old kits can become real gems with a bit of work. She's a gem! Great job! Gino - Thanks. It is a good exercise in practice of putty skills!! Also except for snow, most armor modelers don't get a chance to finish coat in white!! Bravo Battery! Stand By! -Ready- Launcher up- down range ready! Standing by for launch authorization! AH heady stuff in the mid 60's as we sat in our berm and watched the missiles rise on the mobile launchers shut the blast "proof" doors. Waiting for the go/no go from the old man.....or was it another, NATO drill?- ya never really knew. Thanks Redleg for the memories. Steve - I love it...yep, the units deployed here in CONUS with nuclear warheads and no one knew or complained... ahhh, the good old days when people were grateful for their freedom and did not question how it came!! Hey Mike, that's wickedly-cool! Nice looking model! Believe it or not, they stil have one of these at the Danville, Virginia American Armored Foundation Museum! It looks exactly like your model there! A suggestion---get out to AC Moore's and get yourself some black poster board for tricky photo subjects like this. You just can't shoot white against that light blue---I've tried it myself with primed models or car models.. I keep a piece of it around for situations like this. I can't wait to see what you do with the M110A2!!! Outside of the science fiction genre this was/is my favorite missle...... pretty hot looking like Marilyn Monroe of that same era. it somehow got "wasted along the way". Steve - I am always happy to have you stop by. This kit does bring back memories of a time long past. As for Marilyn.... it think of it with a little more class, like Sophia Loren. Comparisons between the two are for another forum!! LOL...Like the two of us, two classics! Nice work! How was that thing transported, or was it a hard-mount? I have that kit, the reissue from 1994 still in the stash. 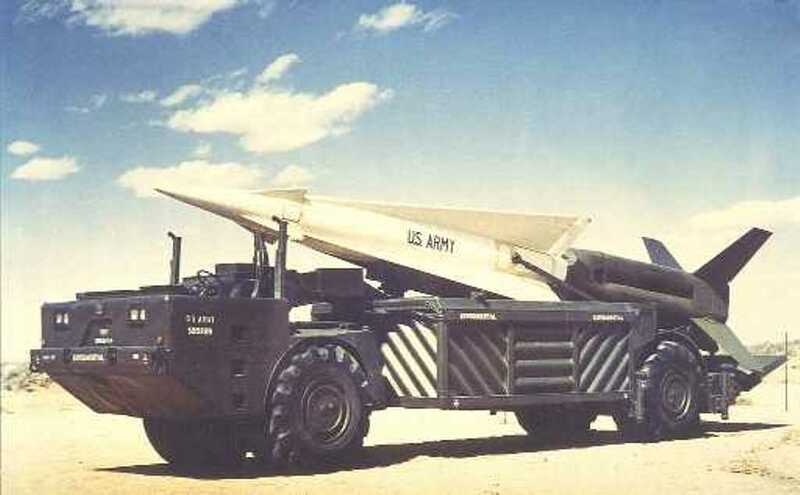 My grandfather served in the AD Artillery in the 1960's and assigned to these in NY. Chris - Thanks, seem like everyone knows someone or a family who served on these!! Build it, it will be fun! Mike, that's just amazing! Awesome work sir! Thanks for posting unusual and obscure weaponry builds on this forum! 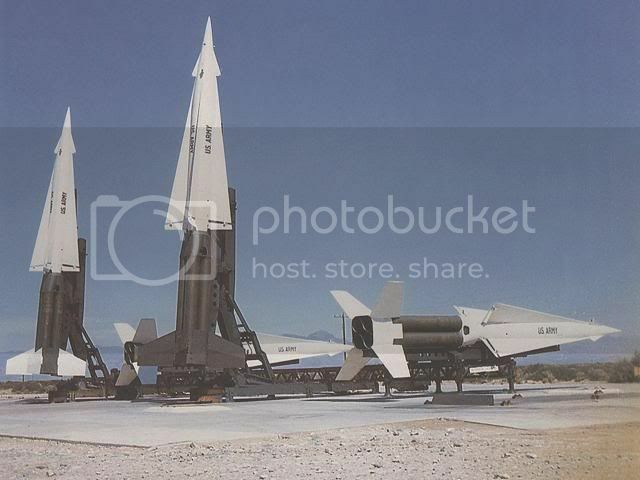 BTW, I was going to ask just how big this Nike Hercules was, but that last photo you posted answers my question! Its smaller than I originally thought... when looking at your previous photos I perceived them being much larger! My friend thanks. I always try to keep everyone up to date on the different and strange. It is not huge but for armor modelers a 13 inch long model is big.... if you model ships, its a destroyer! Beautiful work there, Mike, as always. My sincere compliments. There's one in the headlands in Marin that is raised out of the ground and made launch ready, once a month. There's the remains of the complexes all over the area, the most creative use of one silo which is really a big rectangular room; is the Marine Mammal Centers seal hospital. Mike I agree, although the thought of nuclear warheads going off ten miles down range from San Francisco is only slightly better than the ones dropping out of those incoming Bears. Very happy to have survived that era. West of downtown Dallas, on the west side of the Trinity river, there was a battery complex for Nike-Ajax, which was upgraded to Hercules. About due for yet another marginally-useful renovation/adaptive reuse of the complex. This remains complicated due to compliance with one or more of the STARTs (which is a different discussion for another forum). Yet another reason we need a 1/35 GOER kit. First kit manufacturer to get one out reaps great rewards, since, if memory serves, there's the cargo, tank, recovery, and the missile carrier variants that could be made. G - I agree, the idea of a nuclear warhead going off that close!!! Then again we all survived and considering all the strange thing we did in the 50s and 60s, that's amazing. Capt - The M520 would be interesting. I do have the Commanders Models 1//35 resin kit. Yep there was a cargo version and a tanker version for fuel as standard built versions. Like the picture above, there were many other one offs and special uses. Excellent job on your Nike. Here in Alaska, they were mounted under a steel clamshell launcher. There are several sites that still exist here. One is C battery outside of Eielson AFB, and another is close to JBER (Elmendorf, Ft Richardson). I have gone through C battery many times. There is a picture of it on Wikipedia. Richs - Thanks. Many of the were in those type of launchers were also down here in NJ. Hey wow, another winner there! I love seeing those old kits we slammed together as kids built by someone as skilled as you, real demonstration what you can do with one of these gems in the rough. Funny, I'd always assumed the missile was a lot bigger too. Gamera - Thanks, I love the old kits. Yes the take some TLC but can turn out to be a nice finished build. 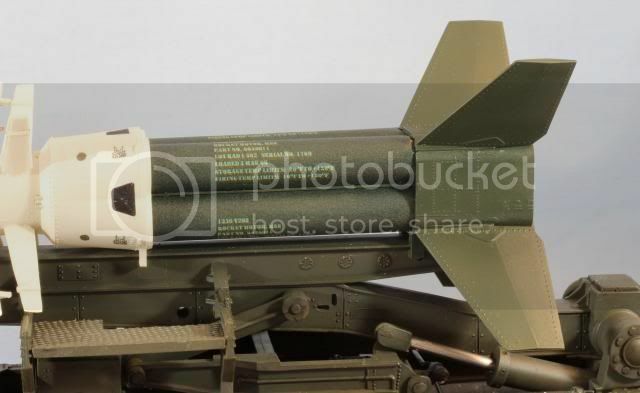 Of course the army was able to move rounds (missiles) even whole Batteries, this was (mid 60 s) as part of our shoot and scoot theory . Re transporting: Technically Nike herc was mobile; in Germany we had "mobile" launchers and "round ready transporters" . for in battery movement . Think of moving your house, possible but you don't like to do it too often.